Detailed description of overall site, sizes and number of stones, etc. May also contain a few general notes relating to site. Details of directions to reach site. Note, describes route taken by author during initial visit. Other, possibly better, routes may be available. Notes on available parking or lack thereof. Authors notes taken in the field along with thoughts and observations. Note, these may include some very non-scientific comments and theories. View Hi-Resolution Image: Link to 800 x 600 pixel image. Type: See Stone Types above for details. Nearest Town: Nearest large town, generally with facilities such as petrol, shops, etc. Nearest Village: For location reference only. Facilities very limited or non-existent. O.S. Landranger Sheet No: 1:50, 000 series. 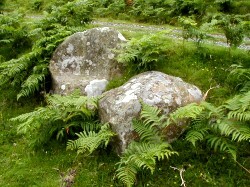 Covers area where stone is located. Actual stone may not always be indicated on map. O.S. Explorer Sheet No:1:25, 000 series. Covers area where stone is located. Actual stone may not always be indicated on map. Grid Reference: Eight figure O.S. grid reference. Can be used with GPS to find stone or locate on map. GPS Reference: Name for GPS use. Symbols: Quick way of providing at-a-glance information. See Symbols key for details.